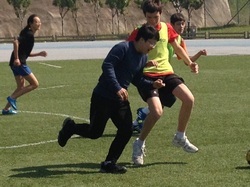 Mark works on his footwork in an attempt to get around the ever vigilant defence of Irene. 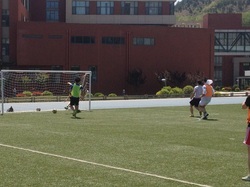 Jun Beom making a great pass. Rebecca works to get a tough cross court shot. 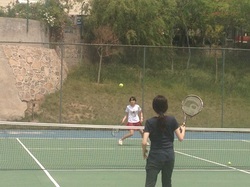 Maggie working on her backhand. High school girls key assignment day. 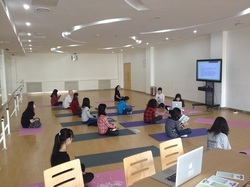 Inner Yoga Studio instructors begin the class with a short meditation. Classes work through a full sun salutation. Basketball unit quiz study guide. Volleyball unit quiz study guide. 1. Describe the effects of aquatics (lane swimming and pool sports) on personal physical fitness. What do you think you most improved upon in this swimming unit? How did you think achieved this improvement? -ONLY ONE MISSING ACTIVITY LOG MY BE MADE UP. -IF YOU HAVE COMPLETED ALL ACTIVITY LOGS TO DATE YOU MAY USE THIS ESSAY AS AN OPPORTUNITY TO EARN BONUS MARKS. • With firm wrist, arm toss the ball 18 inches - so that the ball would fall to the spot just inside of the lead foot and in line with the hitting shoulder. • Hand follows elbow. Wrist firm throughout serve. • Contact with heel of hand through middle back of ball. • The contact should sound like a "thud", not a "slap" sound. • Hand follows ball to target. Finish with hand alongside or within body line. • Be "ready" with arms at 90 degrees from your body . “Ready” to move. • Bend at the waist - shoulders forward - hips back. • Maintain 90-degree angle between arms and upper body. • Legs should also be bent. • Ball should come off the same spot on lower forearms (just above the wrists) each time. • Keep hips BACK during pass. • If you need to swing your arms, the arms should swing in only one direction (toward target) while passing. • Make sure your forearms face in the direction you want the ball to go. • Move to the ball without crossing your feet. • Try to get to the spot before the ball does. • Feet wide apart, hands in front and palms to the ceiling. • Feet should be at least shoulder width apart. • Body position is low and balanced with feet pointing straight ahead. • Arms and shoulders are relaxed. Shoulders are forward and hips are back. • Hands ahead of head. Head ahead of shoulders, shoulders ahead of knees, knees ahead of feet. • Dig the ball 20 feet high and 3 feet off the net - so that the setter has time to run under it and the team has time to transition. • Wait for ball with hands 4 to 6 inches above forehead. • Thumbs and index fingers form a triangle through which you can see ball (triangular window). • Rest of hands form the shape of a ball. • The correct contact point is just above the forehead (hairline). • When contacting the ball, the hands move in one direction only. • With your right foot forward and knees bent, place weight on the back foot (left) and at contact, transfer weight to the front foot (right). • As you leave the leave the floor to jump, pull the hitting arm back with the elbow and hand at shoulder height or higher. • The hand should be open and relaxed, with the palm facing away from the ear. • The elbow should swing forward and raise above the head. • Then the arm and hand swing over the top as the heal of the hand contacts the ball. • This is followed by the palm and fingers, which then snap through the ball. • Step preceding the step close a long and explosive one. • Keep the knees bent for all approach steps. • Jump up (vertically) to meet ball. • Contact the ball at the peak of your jump with a straight arm. • Check landing spot, which should not be more than a distance of one foot past the contact point. • Seal the net with your hands, thumbs pointing to the ceiling a balls width apart, and arms locked. • Whenever possible extend your arms across the net (penetration). • When you move along the net to block, plant so that you jump straight up and down. • Land in the same place from where you jump. • Seal and be square to the net. CARRY HANDS HIGH. When moving along the net and when jumping, carry the hands at shoulder height. "develop personal goals to improve performance in aquatic activities"